Komushiro Bridge is an important way to go to Shakain in the old times. The details about when and by whom this bridge was built are unknown. The foot of the bridge is very unique in that the bottoms are thicker than the upper parts. This is called "Saya Ishigaki" technique, with which the stone walls are curved like a saya, a sheath for swords in Japanese. This technique is also used in Tsujunkyo Bridge. With this technique, this bridge is still used by local people, without wearing out. 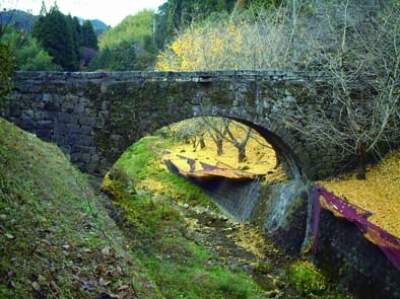 In autumn, you can see a beautiful scenery of the bridge and ginkgo trees. This arched bridge, with the size of 47.0 meters long, 2.0 meters wide, and 8.5 meters high, is designated as a City's Cultural Property.